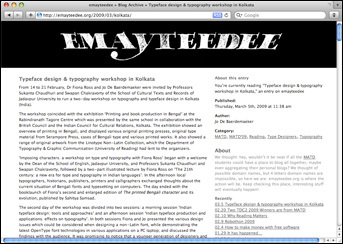 Fiona Ross & Jo de Baerdemaeker in Kolkata — Blog — TypeOff. I don’t know when the semi-secret Reading MATD blog Emayteedee stopped being a secret. Perhaps it was when its feed was added to Alltop’s Typography section. Or perhaps in the age of Google, nothing online is a secret anymore anyway. But since the blog first appeared last year, I was always wary of linking to it, because… well… someone told me that it was a secret. typeface design & typography workshop in Kolkata. Fiona Ross, a lecturer (part-time) in the Department of Typography and Graphic Communication, gave a typography and typeface design workshop together with Jo de Baerdemaeker in Kolkata, India. As far as I remember, Jo is still a PhD candidate at Reading. He’s also MATD Alum, and designer of typefaces for at least the Latin and Tibetan scripts (see his work at typefacedesign.org or at his own website, typojo.com. Jo wrote up the report to Emayteedee on their trip (with pictures! ), and it is well worth a read.